As a manager, you may create only a few Word documents. But you may often edit documents that someone else has prepared. There are few things more frustrating for a team member than to have the boss "just do a quick edit" on a document. Too often, that document comes back in a mess, and your team member will have to spend time cleaning it up. That means your team is spending its time mucking around with Word, and not spending time getting on with the job at hand. Here are 6 tips on how to be kind to your staff—and improve your team's productivity—when editing someone else's document. You can see an end-of-paragraph marker. Before Word 2007, click the ¶ button on the toolbar. In Word 2007 and Word 2010, click the ¶ button on the Home tab. Or, in any version of Word, do Ctrl-Shift-* instead. The basic unit of construction in Word is not a line or a page. Word barely knows what a page is, and isn't too sure about a line. The basic unit of construction in Word is a paragraph. You create a new paragraph when you press Enter. The Enter key is the create-a-new-paragraph key. 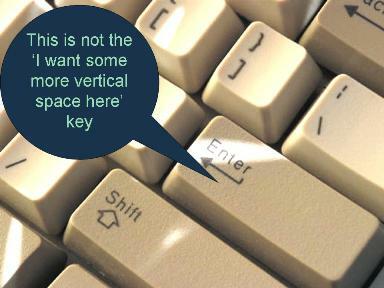 It is not the 'I want some more space here' key. If you press Enter twice you'll get an empty paragraph. A document should not be littered with empty paragraphs. Read why. Be nice to your staff: If you have to edit a document that someone else has worked on, press Enter once at the end of every paragraph. What style has been applied to this text? In Word 2007 or Word 2010, you can add a Styles box to your Quick Access Toolbar. As you move around the document, it will tell you what style has been applied to the selected text. I have a friend who tries to tell me that he doesn't use styles in Word but that some of his team do use styles. I feel for the team. Be nice to your staff: If you have to edit a document that someone else has laboured over don't muck up the styles. NEVER click on the font or font-size drop down lists in the toolbar or ribbon. NEVER apply bold or italics to a whole paragraph to make it look like (eg) a heading. If you can't use the Styles drop down box, or click the appropriate style name in the ribbon in Word 2007 or Word 2010, then maybe use Track Changes to mark every change you make. This will reduce the re-work when the document goes back to your team member. Numbering paragraphs in Word is not always easy. OK, you knew that. With a bit of calm, controlling bullets and numbering is possible. But Word expects to number paragraphs in an entirely systematic way: no missing numbers; no repeated numbers; no mixing of numbering 'levels'. Be nice to your staff: Don't expect your people to be able to come up with un-systematic numbering. Don't expect people to be able to skip numbers or repeat numbers. Don't ask for blue heading numbers in chapter 1 and green numbers in chapter 2. This is not the time for creative whims of fancy. Stick to simple, sequential and systematic numbering. Be nice to your staff: If you're editing a document with bulleted or numbered paragraphs, use the appropriate styles to get Word to do the bullets and numbering automatically. Don't type the paragraph numbers using the keyboard: your staff will just have to undo your contribution when the document gets back to them. Some images in Word float; some are in line. This determines whether they wander around the page like lost souls. Be nice to your staff: If you're editing a document that someone else created, do not, ever, press Enter Enter Enter Enter to get 'past' a picture. The problem is that the picture is floating. Make it an in line picture. A Word document is like a scroll of text. When Word thinks it's had enough of one page, it pops your text over on to the next page. It actually does this very cleverly. Let it do its thing as much as possible. "I want this paragraph always to be at the top of a page". For example, a chapter heading might always need to be at the top of a page. "I always want this paragraph on the same page as the next paragraph". For example, you'd never want a paragraph like "Our audit concluded that the following six items require attention:" on the bottom of one page, with a dot point hanging around like a lost soul at the top of the next page. In these circumstances don't use a page break, because it's not what you need. Instead, decide what you really want and tell Word "I want this paragraph always to be at the top of a page" or "I want this paragraph on the same page as the next paragraph." Word has simple, yet smart commands to control pagination. Word has lots of bugs. I could name hundreds if I didn't have real work to do. But you can reasonably assume that most features of Word do work properly most of the time. "Steve gave me a document and the table of contents was messed up. Therefore, Word's table of contents feature does not work. Therefore, I will make my staff create a table of contents by hand, and manually re-create it whenever the text changes." "Susie prepared a monthly sales report for her division and the heading numbering was all wrong. Therefore, I conclude that Word's heading numbering does not ever work. I'll make her do it manually, so that she has to re-number every paragraph if I decide to insert a new paragraph at the top of the document." "I don't allow my people to use styles. They don't work. I make my staff use a dozen mouse clicks to format every paragraph instead of one mouse click to apply a style. I just can't work out why my people are so unproductive." Most things in Word work most of the time; it is worth encouraging your team to learn how to use it well. This page was especially written for [names withheld to protect the guilty--you both know who you are! ].